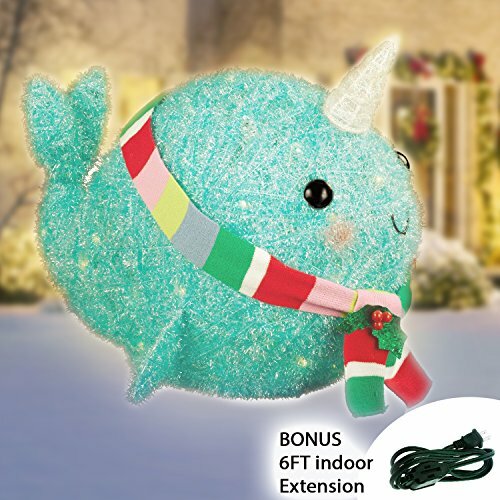 Enhance your holiday decor with this cute16" Tinsel Narwhal. Comes with an additional 6ft Greenbrier indoor extension cable. Easy to assemble with 50 clear lights and 3' cord, this adorable Narwhal has a knitted scarf wrapped around his neck. Sure to become a holiday favorite! Ground stakes provided for securing outside. Dimensions: 17.25 " x 20.5" x 14"
CHARMING addition to your home CUTE with colorful scarf and STUNNING at night! MEASURES 17.25 " x 20.5" x 14"
If you have any questions about this product by Wonderdec, contact us by completing and submitting the form below. If you are looking for a specif part number, please include it with your message.